The three-story home features more than 1,750 square feet of living space with two bedrooms, three full baths, a half bath, study, two-car garage and rooftop deck. Located at the corner of Elmont Drive and South Pleasant Valley Road in east Austin, East Shore includes a total of 30 freestanding city homes priced from the mid $400s. 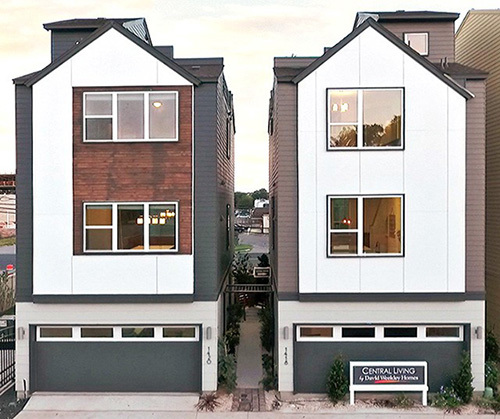 The three-story, single-family homes feature garage parking and fenced-in backyards, rooftop decks and some homes with views of downtown. Four floor plans,ranging in size from 1,200–1,875 square feet, include three bedrooms, three full baths and a two-car garage. The National model home in East Shore. The community will include an onsite swimming pool and offers nearby walking and jogging trails. East Shore is located less than three miles from downtown Austin in the heart of Austin's East Side – an area known for many shopping and dining options with restaurants, local bars and food trucks. In addition, homebuyers will also have nearby access to walkable outdoor recreational activities at parks or paddle boarding at Lady Bird Lake and the community is within walking distance to the Boardwalk on Lady Bird Lake. The model home is located at 1418 Waterloo Shore Lane in Austin and is open daily from 10 a.m.-6 p.m. for tours. For more information about East Shore, contact 512-821-8818.